SkyCMD gives you a shell like interface via browser to administer your Windows SkyDrive account. API call and source codes are also available for SkyCMD. You already know what is Secure Shell or SSH, it has been introduced recently by Microsoft on 1st April. It is not really an April Fool joke but a serious project, they have already uploaded the needed source codes for development using SkyCMD in GitHub (getting astonished?). Let us go in to preliminary details on SkyCMD. Access to SkyCMD is easy. Simply point your browser to skycmd.com and type login and hit enter. Login is through HTTPS protocol but SkyCMD itself is non HTTPS. As most developers will like the green fonts, typing green and hitting enter will bring the green fonts. If you type help and hit Enter key, it will show you the available main commands for SkyCMD. Its looking like Terminal of Mac OS X to me, except the font, any way it is good approach and specially SkyDrive might be useful for the developers now. The bug is bad. On Opera and Mac Safari browser (I have not tested on other browsers), if you use keys to get the previously used commands, you can not correct it again – you need to use backspace to delete the typed commands on SkyCMD. Its quite fast – remember we are not using over HTTPS (there is no existing HTTPS url right now). Its almost as fast as like on local computer. You can get the SkyCMD SDK on GitHub, as PHP call can be done, may be Open Source integration will be possible with SkyDrive using SkyCMD SDK. SkyCMD is a good move as probably integration to backup WordPress will be possible with Plugin API call. This Article Has Been Shared 1062 Times! Laptop Security: Do not leave home without it! Hundreds of thousands of laptops are lost or stolen each year. What if it unfortunately happens to you? UEFI or Unified Extensible Firmware Interface took birth from EFI. EFI cleared up various problems with BIOS and enable new functions. Installing ownCloud on Rackspace Cloud Sites step by step guide. ownCloud is a server software that provides device independent storage of pictures, documents. 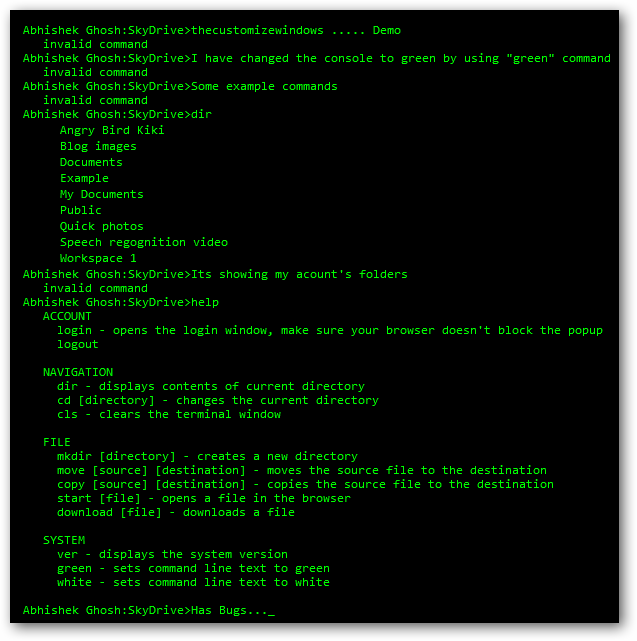 Cite this article as: Abhishek Ghosh, "SkyCMD : Features of Command Line Version of SkyDrive," in The Customize Windows, April 9, 2012, April 25, 2019, https://thecustomizewindows.com/2012/04/skycmd-features-of-command-line-version-of-skydrive/.